This entry was posted in Race Updates WSG Mountain Racing Team update. on April 29, 2008 by WSG. Wow, what a weekend for the Wasatch Speed Goats! Tim Barnes spun through the Free State 100k for a 4th place finish!! Nannie Amy Sproston competed in the Promise Land 50k to post a second place with a speedy time of 6:10. Monica Ochs scraped her way to a 1st place finish at the Capital Peak 50 miler in 8:46, way to go!!!! Tim Long had his leg speed turning again this weekend for a 1st place finish at the Crowders Mountain 50k! Hats off to the team, you guys rocked!! Sharpest Hooves of the Day! Monica Ochs 1st Capital Peak 50 miler! Tim Long 1st Crowders Mountain 50k! It seems the old Zane Grey handed out another rocky day to some of the runners, I need to get the skinny. Was it blistering hot? This entry was posted in Industry News WSG Mountain Racing Team update. on April 25, 2008 by WSG. 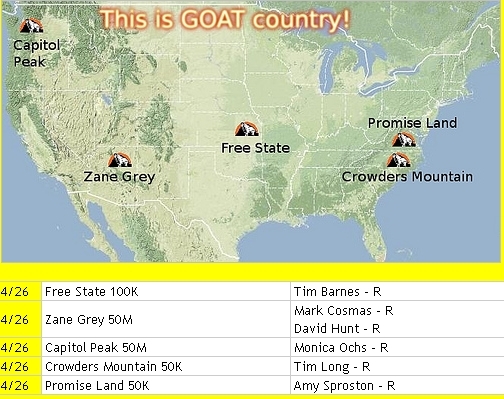 Thanks to Chris Boyack, trail runner for Wasatchspeedgoat.com, has put together race updates for the goats. Here’s the team schedule so we can keep up to date on the teams progress. Three scrapes for Chris! Looks like a big weekend for the east coast goats and west coast Goats, scrape hard!! This entry was posted in Industry News WSG Mountain Racing Team update. on April 22, 2008 by WSG. The team WSG has been out there scraping up the trails and posting some killer results! Amy Sproston – 1st place at the Two Moons 100k, probably one of the toughest 100k’s around. Amy should do well at Massaunutten and the Wasatch 100 this summer. Ten scrapes for the win! She won with a cast on her hoof! Larry Hall – The runner who never stops racing! Chicago 50k Finished 6th overall in 3:56:44. 2nd through 6th were fairly close, with about 7 minutes separating these five places. Chippewa Moraine 50k there was between 4 and 18 inches of the white stuff to run through. Postholing is so much fun, as well as sliding off the trail into the water. I finished 18th overall in 5:53:35 andwas so glad to be done. Do you race every weekend? Nice job, need some spotted cow ale from Wynn Davis! Tim Long heads to the Bull Run with his hooves sharpened and breaks the 8 hour barrier on swift 50 mile coarse. 7:49:56 for seventh place!! This was a stacked field with over 300 starters, way to keep the leg speed up Tim! Super performance! Chris Boyack Heads to the Desert RATS / Spring Desert Ultra to hook up with teammate Sandy White. “Too cool to have a teammate in the same race and be able to offer encouragement and motivation.” How cool is that? Sandy made a great final comeback to finish strong in 10:01 (10th place?). Strong work, man! I finished 10 minutes later with 6 blisters, one missing toenail, 14th place. Way to represent the WSG in the desert! These are just a few updates with more on the way, this team is out enjoying the trails every weekend! Nice work. I want to thank every one who applied for the team as I was hoping to get 4 or 5 people together, instead I received up to 60 e-mails about the team. I do have every one’se-mail on file as we hope to expand the team next year! Super Thanks! This entry was posted in Speedgoat Updates on April 17, 2008 by WSG. The mighty Hardrock gets another WSG Speed Goat (Marc Cosmas) on the runners list! Congratulations! Marc was just informed he’s off the waiting list in front of heavy hitters like Scott Jurek and kyle Skaggs. What a show down if those two get in! Team mate Steve Pero is going to finish his second Hardrock as for me I am looking for my first finish. The year I ran we went the same direction and bonked after crossing Handies Peak with Stephanie Erhart. Long time friend Todd Salazar was there to witness the carnage. C-ya in July Todd! Bahahaha! Steve Pero’s wife Deb paints a finisher print for all the runners each year, she is also running to re-visit Virginia’s pass ( Steve quotes” It’s not only one of the coolest aid stations, but is where Deb and I announced our engagement during the 2001 Hardrock!”) How cool is that! Recognize these two???? Leave a comment and guess? This entry was posted in Industry News Speedgoat Updates on April 15, 2008 by WSG. Thanks to the following sponsors the Wasatch Speed Goat Team came together for 2008! Clarence Mason – Fasted 70+ in the Northeast! 3 Scrapes for the team!!! committed to promoting human powered, sustainable recreation. This entry was posted in Speedgoat Updates on April 11, 2008 by WSG. It really needs to stop snowing in Utah, I just ran a 100 miler completely out of shape and I come home to more storms and more snow. The upper body gets a great work out and so does the legs but I need to find some dirt and run. Do you think Hardrock will even happen this year with the Snow pack? Steve Pero, give us the skinny? This entry was posted in Gear Reviews on April 5, 2008 by WSG. The Black Diamond Ion showed up in the swag bags at the Twomoons 100. This is a unique race because of the staggered starts based on your estimated finish time. I hit the trails 9:00 at night for the first full moon and was able to run with the Ion all night. After sun rise I left the headlamp on my wrist (1.3 oz.) and used it as a back up light for the second night. The 6v battery throws out a nice beam for up to 15 hours of trail running! With your purchase use coupon code 1UX-1-UJENB to receive 10% off on trail running shoes and accessories from Backcountry.com. Some resrictions apply.